McAfee ePO Deep Command provides secure and remote security management access to PCs that may be powered off or disabled. ePO Deep Command utilizes Intel® vPro™ Active Management Technology (AMT) to deliver beyond the operating system management, reducing security operations costs while enhancing your security posture. Using Intel vPro AMT, ePO Deep Command enables secure remote access regardless of the PC’s power or encrypted state so security administrators can remotely remediate compromised systems, enable energy-saving initiatives, wake systems, and apply proactive security. Deploy security ahead of an attack — Switch on the powered-off PCs to keep them up-to-date by installing the latest security updates, patches, service packs, and other important security tasks. You can even schedule a time to switch on your AMT systems using the AMT Alarm Clock feature. Reduce end user impact — Conduct intensive security tasks during off hours by waking up PCs to run scans without affecting end users' performance. Reduce power while maintaining control — Decrease power consumption by encouraging and enforcing power-off policies, knowing that those systems are available for remote security control. Quickly remediate endpoints — Whether the PC is local or remote, the administrator can connect to the disabled PC via Intel AMT to conduct secure remote remediation. Halt desk-side visits and endless helpdesk calls due to security incidents, outbreaks, or forgotten encryption passwords. Finally, security administrators can deploy, manage, and update security on powered-off, disabled, or encrypted endpoints. McAfee® ePolicy Orchestrator® (McAfee ePO™) Deep Command software employs Intel® vPro™ Active Management Technology (AMT) for automated, beyond-the-operating system management that helps reduce operational costs, enhances security and compliance, and accelerates remote PC remediation. Security administrators are assailed by increasing costs, threats, and business requirements. Each desk-side visit caused by malware or other threats can cost up to $250. That’s expensive. It’s also a challenge to physically reach every user’s desk. Remote offices, teleworkers, and mobile employees depend on service-desk calls and overnight shipments to the service depot. These busy users often ignore problems, working on noncompliant, vulnerable systems until a catastrophic failure, a lockout, or disruption by malware occurs. At the same time, the endpoint threat landscape grows more dangerous by the day. Cybercriminals move quickly to exploit new vulnerabilities, using botnets and websites to propagate stealthy and zero-day malware. And some malware can now deactivate operating system-level countermeasures, rendering an end-user’s PC useless. Adding to the complexity, CIOs under pressure to cut energy consumption see idle desktops as a “green” field. They would like to poweroff unused systems, yet need a reliable way to manage security and compliance and run IT processes—scans, updates, or patches—when these activities will least impact users. Manage remote remediation to any PC, anywhere in the world with access from the hardware. Conduct resource-intensive tasks during off hours to limit impact to end users. Eliminate frequent desk-side visits and lengthy service calls. Adopt power savings program, but still maintain access for security or patching. Easily identify Intel vPro-equipped PCs, and then enable Intel AMT for streamlined activation. Streamline and reduce effort to discover and provision Intel AMT to allow customers to quickly take advantage of McAfee ePO Deep Command on Intel vPro-based PCs. Conduct security maintenance or time-intensive tasks during off hours without impacting productivity. Using the AMT Alarm Clock, security administrators can power on and wake up a PC to execute a defined series of security tasks. Connect to the disabled PC via Intel® vPro™ Active Management Technology (AMT), whether the PC is local or remote, to conduct a remote boot from another boot image on the network. Securely extend the reach of remote remediation with full support of KVM and be able to completely control the remote PC’s keyboard, video, and mouse to greatly simplify remediation capabilities. Wake up encrypted PCs with McAfee encryption and conduct security tasks or other updates without the user being involved to authenticate the encryption software. Requires McAfee Endpoint Encryption 7.0. Wake PCs, update policies, and return them to lower power states to save energy and pursue industry incentives to cut power consumption without compromising security. Protect endpoints ahead of emerging threats. You can update systems before a potential breach and remotely activate countermeasures without impacting productivity. Use the McAfee ePO Deep Command Discovery and Reporting module to discover Intel vPro AMT-capable PCs in your environment. Detailed reports ensure you know exactly what PCs you can deploy the ePO Deep Command agent. McAfee ePO Deep Command software helps you get the value of Intel vPro technology by leveraging the Intel AMT alarm clock, remote wake-up capabilities, and keyboard, video, and mouse (KVM), as well as IDE redirection. First, the McAfee ePO Deep Command Discovery and Reporting Module discovers any AMT-capable PCs in your environment. Detailed reports ensure you know exactly which PCs should receive the McAfee ePO Deep Command agent. McAfee ePO Deep Command software also streamlines provisioning of Intel AMT to simplify the activation of Intel AMT. Once McAfee ePO Deep Command software is installed on provisioned AMT PCs, you are ready to begin remotely managing these PCs beyond the operating system, at the hardware level. Now, security administrators can communicate with and take control of their endpoints at the hardware level whether they are powered-off, disabled, or encrypted. This connection to the hardware allows for remote management for enforcement of security or compliance policy and reduction of security operational costs. In addition to a better security posture, these controls allow adoption of power-management programs to conserve energy while still maintaining access to endpoints. Using Intel vPro AMT technology, McAfee ePO Deep Command software accesses endpoints without relying on the operating system. This hardware-level access enables administrators to power-on systems, execute security tasks, and then return the endpoints to their previous power states. McAfee ePO Deep Command software can even securely initiate the boot process of endpoints running McAfee Endpoint Encryption without the need for user authentication credentials to conduct remote security tasks. These operations can all happen automatically through the alarm clock or on-demand. By communicating with endpoints at a level beyond the operating system, McAfee ePO Deep Command software allows you to configure and remediate hard-to-manage endpoints from a central site with the familiar management platform of McAfee ePO software. 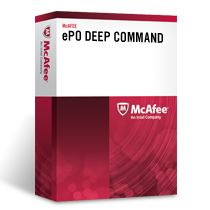 When there are problems, such as when an operating system has been disabled or a hard drive has failed, both administrators and users will appreciate the convenience of integrated management activated by McAfee ePO Deep Command software. Whether the PC is local or remote, the administrator can connect to the disabled PC and KVM via AMT to conduct a remote remediation action, such as instructing the PC to boot from another .ISO image on the network. Redirect the PC to boot from an image from another location on the network. Completely control the local KVM. Reset the user’s encryption password. Clean and repair infected, disabled, or quarantined systems without hands-on access. With this broad control, security teams have new options for protecting endpoints ahead of emerging threats. Systems can be updated before a potential threat reaches them, and countermeasures can be activated remotely, preventing any impact on user productivity and keeping data safe. McAfee ePO Deep Command software enhances the McAfee ePO software management framework, which is proven to scale to hundreds of thousands of endpoints. Designed to support distributed architectures and security management teams, McAfee ePO software provides a unified security policy management and reporting environment for your entire McAfee security infrastructure. Now, it can take your policies and compliance initiatives beyond the operating system, too. By extending the amount of information you can include in McAfee ePO software dashboards and reports, you can increase your visibility into each endpoint’s compliance as well as the organization’s overall security posture. Correlated data makes audit time easy. Download the McAfee ePolicy Orchestrator Deep Command Datasheet (PDF).